Trudi with you today sharing a 'Glitzy' standing egg creation. I had lots of fun combining a few Bella! Glitzy Gold, Foiled Hearts & Stripes with a sprinkling of Ruby Rock-It! 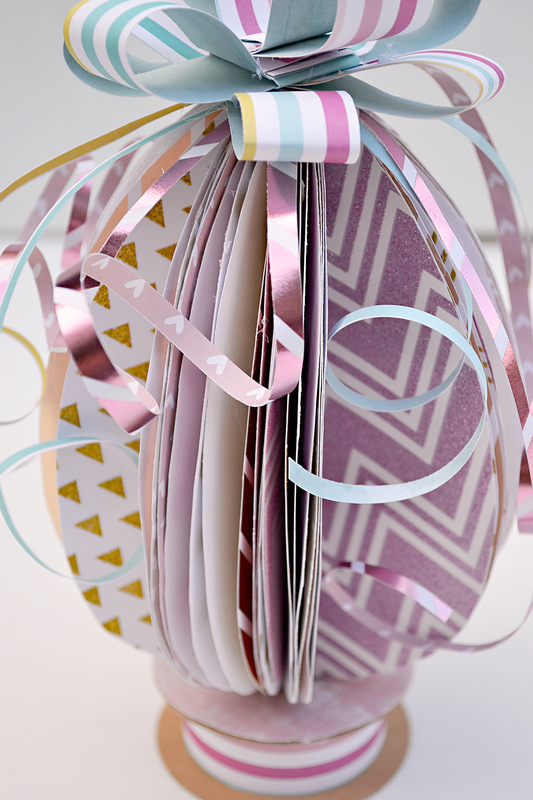 Dancette Glittered and Happy Days papers. This is also a project that you could easily get the kids involved with. I created an egg shape template which I used to create the concertina effect. This egg is on the larger size -I was able to get 4 eggs to each 12 x 12 sheet of paper. Each of the cut out eggs where folded in half and attached at the folds with adhesive. Too create a fuller egg - add more folded pieces. 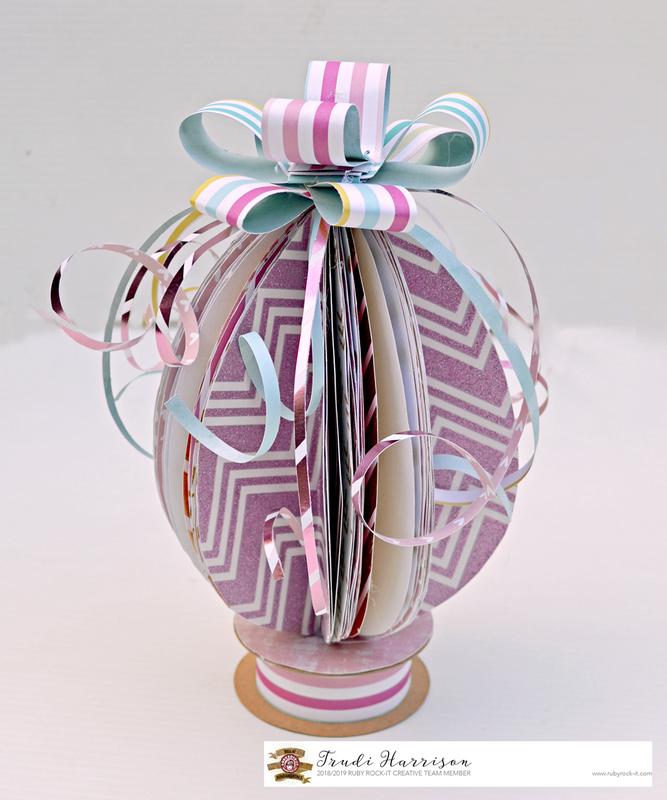 The egg has been attached to a recycled ribbon spool. 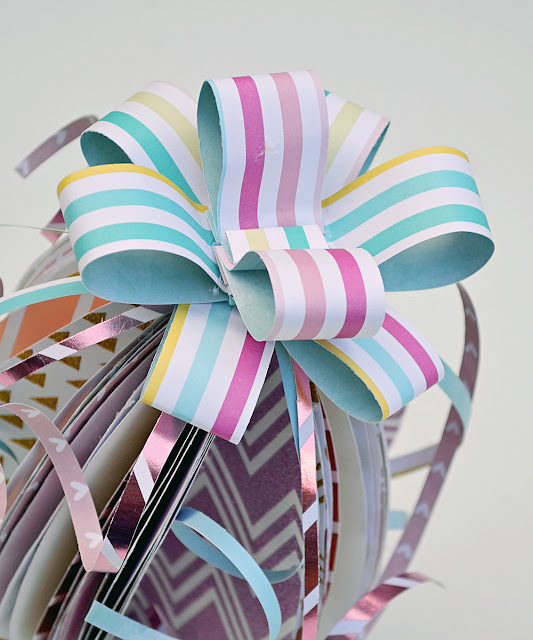 The bow was created from 1" strips of paper which where trimmed into smaller lengths and folded and attached to create loops. To create the curly tendrils trim thin lengths of paper and wrap around thin paintbrush handle or skewer. Happy creating and wishing you all an 'egg'celent adventure! Labels: Glitzy Glitter, Off The Page, Ruby Rock-It!